With appropriate warning from Donald, the day was exactly like he warned us to be, starting with a lovely 0600 wake up call of knocking doors and yelling. Kyle and Parker lead an inspiring devotional out of the first half of Philippians 1. They spoke a lot about what it means to be persecuted and how we need to develop and show how committed we are to God and our faith in Him. After an outstanding breakfast from Momma Maria, the first group left for the radio station. Brent, Sarah, Phil, and Garrett shared their testimonies and Kyle, Jamie, and Jordan lead a few songs of worship. Words of encouragement were broadcasted through multiple nations to bring inspiration to millions. Their words were encouraging also to the team, their transparency brought us closer together as a group. After the group at the radio station came back, we headed out to Pascuala to work on the thirtieth house built by Because We Care Ministries in that village. We were welcomed by smiling faces and squeals from joyous children. 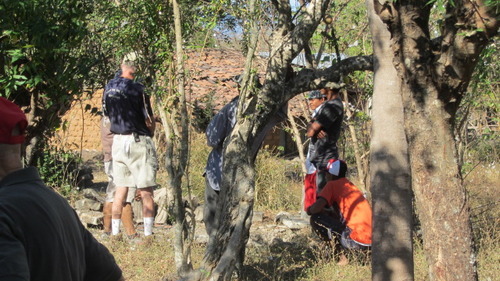 The group then proceeded to dig the ditch for the footing of a house for one of the villagers. While digging the team engaged in various activities including soccer and fingernail painting with the children of the village. After completing the digging in a couple hours in the dry heat of Nicaragua, the footing ditch was finished. Then it was back to Casa De Shelly, to be filled with nutritious vittles, compliments of Momma Maria. Next we headed off to the village of Jinocuajo. At Jinocuajo, the team split up into two different teams, some of the guys played a couple of pick up games of soccer with the boys of the village while the girls and a few of the guys played with the kids at the local church, including leap-frog, coloring books, jump rope, and fingernail painting. After about an hour, we all joined up at the church and Donald told the people the story of God’s love for all people in the form of his son Jesus, who takes away their sins through faith. After this the team distributed a cauldron of soup to the villagers which will sustain them for a day then gave out packets of rice to the mothers for the next couple days. On the return the group threw out of the truck candy and clothing items to people who live on the road. This concluded the days work. Which leads to this very point where I am writing to you! Grace and Peace! After many years of merely observing the work of Dr. Donald and Pam Gillette and Because We Care Ministries, my husband Steve and I finally felt God’s call to accompany them on a trip to Nicaragua just a few months ago. Like so many others, I thought I knew what it meant to be a missionary in a foreign country but I soon found out that my ideals were far from reality. While we were there, we witnessed the absolute epitome of poverty as we had never seen it before. 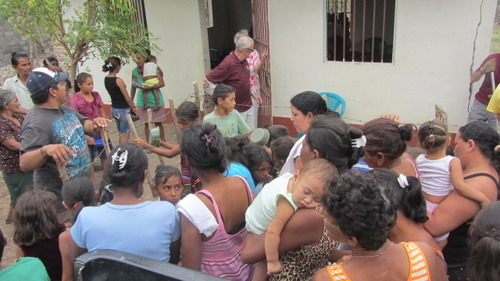 We were astounded at how the most basic human needs such as food, water, shelter and clothing are well outside of the reach of many Nicaraguans on a daily basis. Day after day, we worked alongside Donald and Pam distributing food, clothing and most importantly, sharing the Gospel of Jesus Christ. Jesus made it very clear to us all in Matthew 28:19 when he said “Go ye therefore, and teach all nations, baptizing them in the name of the Father, and of the Son, and of the Holy Ghost”. Certainly, not everyone is called by God to literally “go” but we are all called to do something in support of this Commission. Since we have been back in the United States, Steve and I have been working with our local church to raise funds to build a house for a family in one of the villages that we visited. Clearly, Because We Care Ministries could not reach the people of Nicaragua at the levels they do without the financial support of others. For many years, donations from folks just like you and me have funded mission teams, housing projects, food, and medical care for the people of Nicaragua who live a life that many people cannot even imagine. The Bible tells us that “God shall supply all your needs according to his riches in glory by Christ Jesus” (Philippians 4:19) and for many years, we have seen that evidenced over and over again on behalf of this ministry. As Steve and I prepare to return to Nicaragua in a few weeks, I am praying fervently for the Gillettes and their mission there. You see, several years ago, Donald and Pam both left their careers behind to minister to the people of Nicaragua full time. What a testament to their faith and obedience! Certainly, theirs is not an easy life but so very rewarding. For those of us who haven’t been called to the mission field full time, I believe that our financial support of this couple and their ministry is another way that we can be obedient when Jesus says “go”. 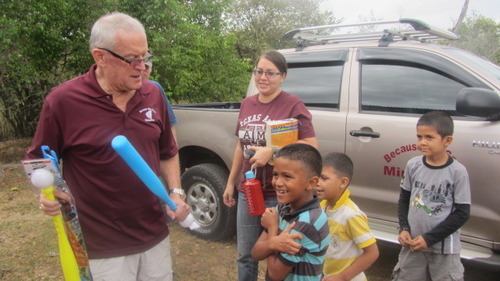 Paula, my wife, and I have made a total of twenty trips to Nicaragua with BWCM and Dr. Donald and Pam Gillette. Like most of you that are reading this, you know that if we go, as we are told “to go” with an open mind and heart we will be changed. 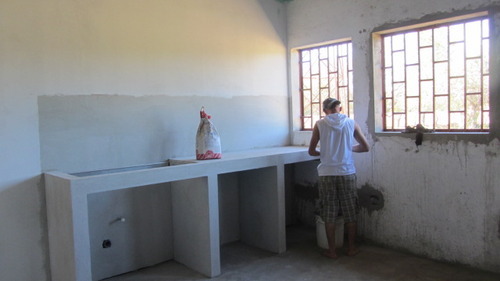 You also know the needs that exist in Nicaragua. . . food, water, clothing, shelter and the list goes on, not to mention the need to “proclaim the Gospel.” As you well know, Donald has no qualms about asking for support for the works of the ministry, but he is hesitant to ask for support for Pam and himself. I am asking on their behalf, that we stay behind this team and their mission. About two years ago they both left their secular jobs to devote their full efforts to this ministry. This of course was a leap of faith. With the ever increasing cost of everything the Gillettes need some monthly support. Since opening Casa de Shelly in January 2005 I estimate that at least two thousand people have stayed and served at the Casa. If just ten percent of these folk could and/or would commit to just twenty dollars ($20.00) a month that would relieve the burden from the Gillettes on how to continue and let them focus on the work at hand. In closing I would like to quote James from the Bible (I love James) James 2:15-16 NRSV “If a brother or sister is naked and lacks daily food, and one of you says to them ‘Go in peace; keep warm and eat your fill,’ and yet you do not supply their bodily needs, what is the good of that?”. So if we say to Donald and Pam “good work, keep it up” but don’t offer, give our support, ‘what good is it’. Thank you for taking the time to read this and please give it your prayerful consideration. After a little more than 12 years serving here in Nicaragua one VERY important lesson that both Pam and I have learned is a complete dependency on Holy God. Another key lesson we have learned is "be careful " what you ask for. In January 2012 we ask GOD to stretch our tent, basically asking God to use us in a greater way here in Nicaragua for HIS glory. I stand amazed at the many doors that GOD has opened and the number of people that HE has brought into our lives. Since early November we have been able to share with more than 300 Pastors in both Nicaragua and Honduras. Our leadership training will expand into Costa Rica beginning in May. With each passing day the demands for "teaching" and "training" continues to grow. The first question ask in Duyure Honduras yesterday was, "When are you coming Back." We have truly seen the desire of these Godly men and women to grow and become better and more effective leaders for Christ. Along with this growth in number comes a GREATER demand on BWCM for supplies and food for those that are attending class. On a day when these men would be in the fields working to provide for their families they are now in class. We try to provide food for them to take when it is available to make their day a little easier. We truly thank those that have helped in purchasing books and supplies. Our mission here has not changed, it has only expanded. I’m working to fill my extra time in country with the training center (farm) and pastor/leader training. Our plan is to continue to grow in each area as GOD provides. Today we are continuing to reach out for more teams to share in the work. We are looking for new contacts (churches) that has a desire to do missions. If you have family or friends in other churches that would like to see and hear about our work please ask them to contact me. With all this said I need to make a personnel appeal. Over the past 18 months we have seen a continual erosion of our monthly support. I have learned over the past 12 years that there can be any number of reasons and it doesn’t really matter. I realize with the state of the economy and many other factors that it is increasingly more difficult for folks to give. We need very urgently to find at least 30, $100 a month contributors. We are asking churches as well as individuals to help us by increasing your giving or start giving. If it’s only $10.00 a month, praise GOD. Pam and I are just asking for your help over and beyond what you do in your local church. If you are unable to give we truly understand but please don’t stop praying for us. We are Trusting GOD in a might way. I have been teaching our pastors that where GOD leads God provides and I believe that with all my heart. 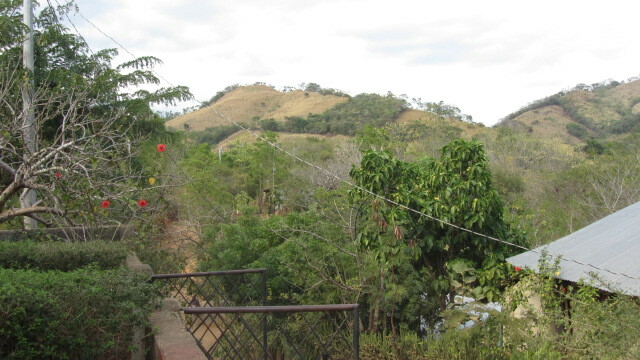 Our Nica News includes both Friday and Saturday as yesterday was a full day. We started Friday at the radio station with Barbara and Becky giving their testimony and Owen presenting a message. 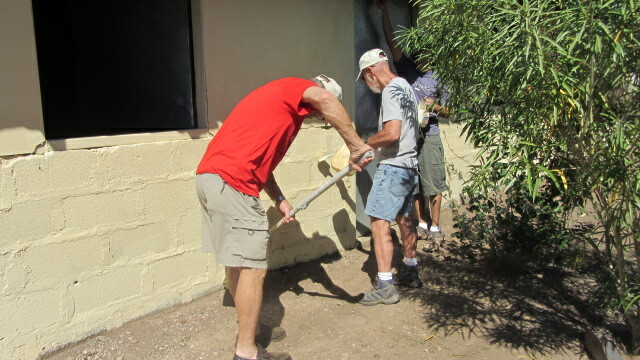 We returned to Pascuala to paint another house and to clean trash along with the villagers of the main street. After lunch, we went to Santa Teresa where we engaged with the villages, fixed them a meal, and distributed Manna Fest bags. 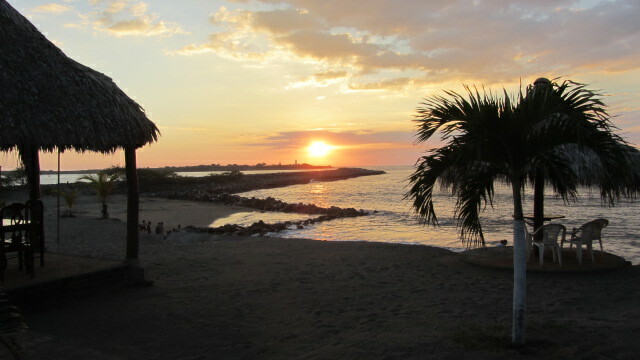 Once we returned to the Casa, we traveled to Corinto on the coast to watch the sun set into the Pacific. Today we slept in a little later and then went to the village of El Portillo in the mountains. We held a worship service where Owen preached and Donald brought the invitation and called for a decision to follow Jesus. The children had “Crafts with Carla” and the interpreters engaged the children in song. We left food to be distributed by the pastor. This afternoon we traveled to San Francisco where we once again engaged with the villagers, prepared a meal, and distributed food. Before we close, we would like to say something about the age of our group. Eight of us came from North Carolina and East Tennessee. We range in age from 60 to 73. We are telling you this because we want you to know that age does not matter in this ministry. There has been much for us to do, and we have managed the tasks handily. 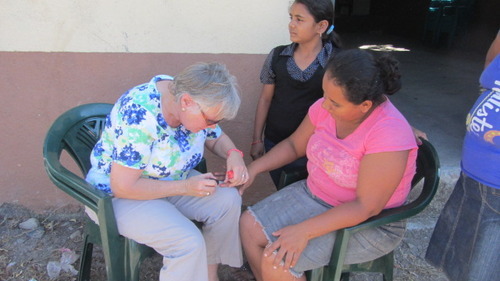 God can use all of us to meet needs both at home and in Nicaragua. We started the day today with a devotion that challenged all of us to step outside our comfort zone to accept the word of God and live faithful lives that others can see. This morning began with the usual trip to the radio station to hear Kim, Kent, and Owen present messages about God's love in their lives and the promise of God's love in the lives of the listeners. Our first journey this morning was a trip to Pascuala where the men came prepared to paint one of the houses built by Because We Care Ministries, but, as with Tom Sawyer, some of the village boys came quickly to do the painting for them. These are houses built by the ministry with the understanding that the villagers take responsibility for building and maintaining their homes in the manner of Habitat for Humanity's "sweat equity" concept. Though we did not prepare a meal for the villagers, we did hand out bags of food to each family. There are 29 homes currently in Pascaula which were built by BCWC Ministries with a 30th home waiting for funding. After lunch, the team took another long trip to Guacimal accompanied again by the doctor. The doctor saw as many villagers as she saw yesterday. All of the children receive parasite medication along with whatever the doctor feels will help individual issues. 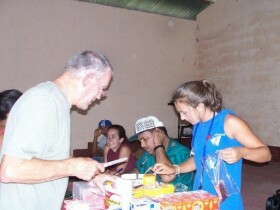 The team prepared a meal for the village–everyone seemed appreciative and polite. There were the usual activities with the children and more food packages were passed out to each family. "Jesus called them (disciples) to him and said, 'Allow the children to come to me. 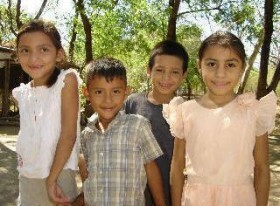 Don't forbid them because God's kingdom belongs to people like these children.'" (Luke 18:16 CEB). Today was a full day, starting with wakeup at 6:00. Following breakfast and devotions, it was on to the radio station for the morning broadcast. Carla and Kim gave testimonies, and Owen gave a meditation centered on Isaiah 43:1-4. When we returned to the Casa, some shopped for groceries and others went to the clinic to clean up from ongoing construction. As a note of interest, the building of the clinic began in 2006, and we are hoping that construction will be complete by February. It has been a slow process due to funding and government regulations. After filling the truck with trash, we took a trip to the landfill where we unloaded the trash, and in the process, presented testimony and distributed mannafest bags to several whom we met there. To further explain, it is important that you realize that citizens will scavenge the landfill for any possible food that might have been dumped there. After lunch the team took a L-O-N-G trip to the village of El Danto. A doctor accompanied us, seeing over 100 patients, distributing medicine and administering parasite medication. Other team members prepared a meal, played soccer, and jumped rope. They also painted fingernails, colored with the children, and painted faces. 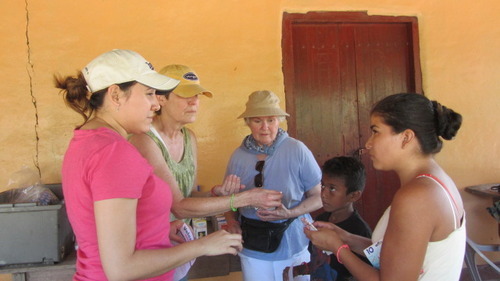 Several team members shared the gospel with various groups of villagers. A busy day, for sure. It is interesting to note that word had gone out earlier in the day to this remote area. There was no organized village, but instead a gracious family that allowed us to set up at their house while we waited for villagers to come great distances for medical services and food. There is such a great need throughout this country, and we pray each morning for discernment on how to meet some of that need and how to be faithful disciples. "I'm not ashamed of the gospel; it is God's own power for salvation to all who have faith in God . . . God's righteousness is being revealed in the gospel.. . " (Romans 1:16-17). A team from North Carolina arrived in Somotillo early this afternoon. Seven members of Bethany UMC in West Jefferson, NC, and one member from First Baptist in Gatlinburg, TN, flew into Managua from Greensboro on Monday night. After a lunch provided at the Casa, the team loaded up in two trucks and took the Good News and food to La Fragua. Carla did a cross craft activity with the children, and Donald, using three boys from the village, told the story of God's love and salvation through Jesus Christ: "God shows his love for us because while we were still sinners, Christ died for us." (Romans 5:8). Of course, we could not leave without painting the girls' and women's fingernails, giving the villagers bracelets, distributing meal packs, and cooking a big pot of stew. For those who have been on a mission team here, you will understand what we mean when we say that we "distributed" clothes, toys, and "caramelos" on our way into and from the village. Another day in the mission field of Nicaragua ~ God is so good! We began our morning with the regular radio broadcast and for the first time in the history of Because We Care Ministries, Dr. Gillette joined the team in our song! The song of the morning was "Just a Little Talk with Jesus" and it was very fitting for this day, and every day. We prayed that God would guide our path throughout the day and that we would be exactly where he wanted us to be and he did exactly that. We spent the morning on the road to San Miguelito where we found many families that were hungry and in desperate need. We distributed Manna Fest food bags to multiple families along with toys, candy and oranges. These bags will feed an entire family for at least a week so you can imagine how excited they were to receive them. Clearly, God led us down this road to minister to all of the families in need but one particular family caught the attention of the entire team. When we pulled up in front of one house, a small girl and her younger brother came running out to get some food. When we asked where their mother was, they told us that their mother was in the hospital. After a few more questions, we determined that these children were at home alone and there was no food in the house. A lady that lived nearby told us that she was looking after them but God certainly knew the desperation of these children and put them directly in our path today! Thank you Lord! 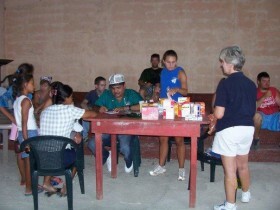 After the Manna Fest distribution, we headed out to Villa Esperanza. We took the bounce house and the children of the village were ecstatic to see us coming. They ran out of their houses to follow us down the road and watch the house being set up. While the children played, we prepared the stew that they would later eat. Once again, God provided more than enough! The line for stew was very long but after everyone's bowl had been filled, there was stew remaining in the pot! Praise God that so many children and their parents were able to enjoy more than one bowl of the delicious stew! Although being able to provide for the physical needs of these children is a blessing to us all, the opportunity to share God's plan of salvation with the people of Nicaragua is the most important mission of this team. 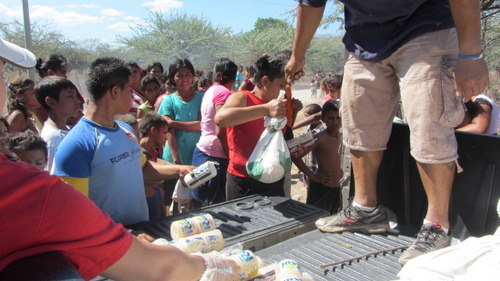 We shared with each of the families on the road to San Miguelito and Villa Esperanza. We prayed with many to accept Jesus as their personal Lord and Savior! God is good! Another day on the mission field and today, God showed up in a big way! The day began with prayer and Bible study among the team and we prayed for God's blessings on our efforts for the day. We traveled to the market to purchase supplies to make stew in one of the villages and candy for the villagers. Once we arrived back at Casa de Shelly, we prepared the ingredients for the stew and packed bags full of Christmas toys to be given to the children in La Flor. In addition to the toys, we had three cases of shoes that were to be distributed to the children. Once all of our preparations were complete, we headed out to be the hands and feet of Jesus. En route to La Flor, we distributed candy and small toys to the villagers along the way. When we arrived, the village was in the middle of their church service so, with the permission of their Pastor, we joined them. Hearing of our arrival, children began arriving at the church anxious to see what we might have for them. We shared the Word of God and the plan of salvation with the children and their parents and many prayed and asked Christ into their lives. After sharing the gospel, we began to fit the children with their new shoes and distributed their Christmas goodies! What a blessing to see their faces light up and hear their laughter! After we had given out all of the shoes and toys, we headed back to Casa de Shelly to replenish our supplies and grab some lunch. Of course, when we arrived back at the house, we had the most delicious chicken tacos waiting for us. Still excited from the morning's mission, we quickly ate and began to reload the truck with toys, candy and the ingredients for our stew. Once we had all of the supplies in place, we headed out once again. We drove several miles down a dirt road to the village of Laredo. Secluded and far from town, the people of this village were more than happy to see us coming! 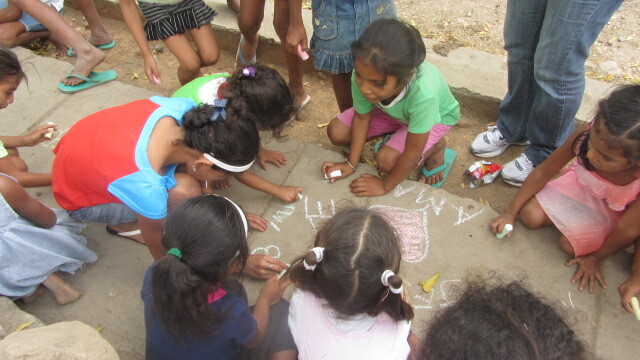 Upon arrival, we immediately began to engage the children with games, jump rope and sidewalk chalk. As many of the team played with the children, others were beginning to prepare the stew. It's hard to imagine the significance of the stew ~ people who haven't had fresh vegetables or meat for a very long time seemed to understand it clearly. As the stew began to boil, the children and their parents ran into their homes and quickly returned with anything that they could carry their stew in ~ they knew it was time to eat! The children formed two lines and waited patiently until it was their turn to receive their stew. What a blessing to know that each and every person in Laredo will go to be tonight with a full tummy! When we headed out to Laredo this afternoon, we had no way of knowing how many folks would turn out with their bowls for some stew but God knew exactly how much we needed and every bowl was filled. When the last bowl was pushed forward for a ladle of stew, the pot was empty! Clearly, God showed up when we needed him most and provided just what we needed for the people of Laredo. Thank you Lord for your love and goodness!